The original all girls party night. Hot girls, drinks deals and DJs to keep you on the dance floor all night. Every Tuesday 10pm-3am @ Klub ‘KU’ – Soho. London�s most awarded gay bar and Klub – �Ku,� turns over it�s state of the art club every Tuesday night for exclusive use by the gay girl party-goers. The gorgeous bar staff from sister lesbian bar �She Soho� boot the boys out from behind the bar to keep the drinks flowing, and an all-female team run and deliver the night each week. Izzy Trixx, best known for international festivals including Holi Festival, Isle of Wight and Bestival is the fierce weekly resident behind the decks. Weekly drinks deals and monthly entertainment special nights. Every week a pre party takes place at She Soho, where guests can get hold of a wristband gaining free entry into the Ruby Tuesday�s night over at Klub. Otherwise, �2 cover charge at the door. Don’t forget you can get free entry to SHE Bar Soho if you sign up to NL Emails Here > 1st, 2nd and 3rd Tuesdays of the month resident DJ Izzy Trixx is joined by special guest DJS. 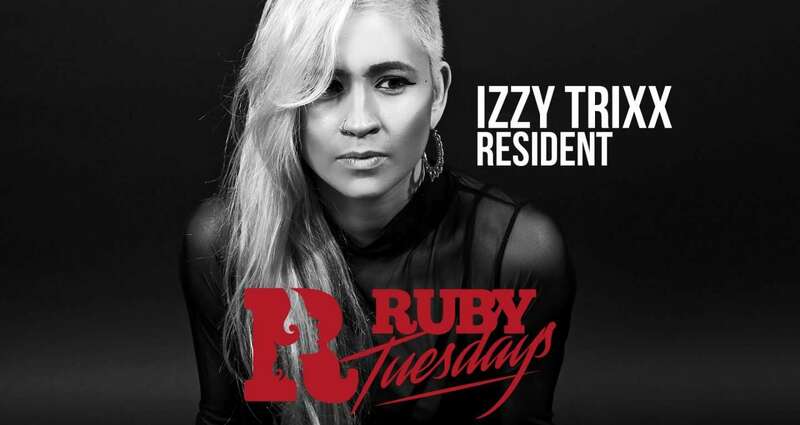 Last Tuesday of the month, is Izzy Trixx takeover where our internationally renowned resident plays hip hop, RnB, commercial remix club classics and house.